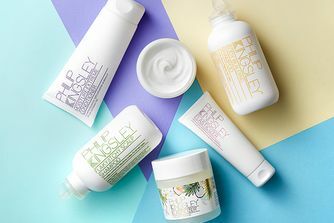 A truly iconic hair product, Philip Kingsley’s Elasticizer is the world’s first pre-shampoo conditioning treatment. Originally created for Audrey Hepburn, the formula has since been showered in beauty awards and attracted ardent devotion from celebrities, beauty editors and even royalty. The secret to its success? It adds elasticity, manageability, bounce and shine, leaving hair luxuriously nourished and healthy at the very beginning of your ritual, so you can expect stronger, healthier hair with less breakage. An iconic hair hero, Philip Kingsley’s Elasticizer will transform your hair care ritual. A luxurious pre-shampoo conditioning treatment, Elasticizer has attained legendary status and legions of fans thanks to its deeply conditioning effects; originally formulated for Audrey Hepburn, it boosts elasticity, manageability, bounce and shine, delivering rich moisture to the cuticle without weighing strands down. Leave it on for a minimum of 10-20 minutes or even overnight for a deep treatment when your hair needs some TLC. A total treat for tresses, the formula stars hydrolysed elastin, castor oil, olive oil and glycerine to boost hydration and lock in moisture, to leave hair looking intensely nourished, healthy and shiny – and all before you’ve used shampoo. Impressive! With frequent use, you can expect stronger, healthier hair and less breakage – you’ll never want to wash your hair without it.